It was the night of Durga Pooja and Garv reached the temple premises at decided time. At a distance, he spotted an old man coming towards him, draped in saffron cloth. It was the same priest who had invited him over. ‘Namaskar Pundit-ji’ Garv folded his hands. ‘No, pundit-ji, I’m absolutely fine. Just a little tired. Teaching in college does that to you…’ Garv smiled. The clock struck 12. It was midnight, the right time to perform the ritual. The old priest asked Garv to sit with his legs folded and lit fire in a pot. He then covered the pot with a steel lid having a big hole on it, so that the smoke could come out, and they could insert their ingredients in it. ‘Yes, pundit-ji.’ Garv beamed with a bright smile. The priest started chanting some verses and he kept pouring oil and some herbs into it. The fire was becoming restless inside the pot. ‘Our mind, is like this pot. The thoughts are fire. They always try to come out, but they should always be controlled else they can burn the pot itself. The steel lid that we have put upon the pot is like the barriers that we put upon our heart to control our desires. The vile, hurtful desires which have power to destroy everything.’ the priest chanted some more verses and explained the meaning of the ritual to Garv. Garv was getting it. His anger, his rage was the fire and he needed to put a steel lid on it to control his desires. He couldn’t let it burn everything. He followed the priest and did whatever he was instructed to do. ‘There are two types of magic in this world. Black magic and white magic. 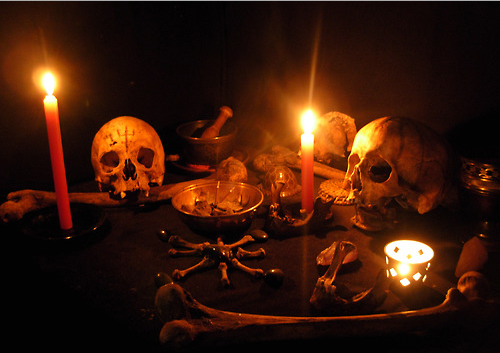 Black magic enables you to possess a control over things and start a chain-reaction according to your desires without thinking about the harm it can do, but white magic is done only for goodness of humanity. Like night and day, these two types of magic maintain a balance in the world. Scientific world thinks that it’s a hoax and that there’s nothing like magic, but those who have experienced it will understand how far humanity is yet to reach. We believe what we see, and now that you’ve seen what’s inside you, you are afraid and you want to stop it.’ the priest gave some sandalwood sticks to Garv and asked him to put them in the pot. He threw the sticks inside the fire and the fire became fierce. ‘Have you thought how somebody becomes a star overnight? A bankrupt person becomes a millionaire in a week? Or how is that sometimes, someone has everything – talent, looks, knowledge, yet he remains unsuccessful? Isn’t it a bit tricky to understand how it happens? How is it that a poor has nothing to eat, but the rich’s dogs too live a classy life? Don’t these questions come in your mind sometime? What do you think?’ the priest stormed his minds with questions. ‘No. I’m not talking about everybody. I’m not generalising anything. But, there is a percentage of people who have a history of dark-secrets behind them. Secrets they don’t want the world to know, and that makes them different.’ the priest gave him some dry-wheatgrass. Garv threw it into the pot, the fire again became fierce. ‘Have you brought what I asked you to bring?’ the old man asked, ‘It’s time.’ The priest saw the clock. It was exactly 1 am. ‘Yes, pundit-ji. I have brought’ Garv slipped his hand inside the pocket of his trousers and took out a folded handkerchief. He gave it to the priest. The priest opened the handkerchief, picked up hair-strands and threw them into the fire. The fire was fiercer than ever. ‘Revenge is darkest of all powers. When you seek vengeance, the strength of your energy doubles. Why? Because you focus your mind, your energy on that one person who hurt you. You think about him till you kill him in your mind. Have you ever felt like killing someone? Of course you have. Everyone has. But in some cases, like yours, that power is so fierce that its affect is visible in the outer world. Your thoughts generate so much energy in one direction that it ends up killing a life.’ the priest explained Garv the mechanism of the power he possessed. He now understood how it all worked. ‘But are you sure this procedure will reduce that power?’ he was still confused. ‘Son, I told you, my rituals never fail. I told you it will result into betterment, and you are a free man now. You aren’t controlled by anything, or anyone…Remember – one last push.’ the priest stressed the last sentence. The ritual was over and Garv left the place. He was feeling relaxed and much better now.